After about decade of health recovery so far, I’m so grateful to have the opportunity to share my story of how I started to feel better. I’m calling it my Journey to Clean Eating! I get asked a lot about my experiences, especially in relation to diet. It seems pretty overwhelming looking at that list, but I know so many other people are suffering, too. The symptoms from diseases or conditions can really start to add up, and I’ve experienced everything from insomnia to hives to fatigue that just wouldn’t go away. If you are feeling down because of an endless list of issues, I can honestly say that I know what that feels like. Growing up in the 1980s, my ideal meal was 100% processed food. Food companies marketed heavily to children, and I begged my mom for sugary cereals, candy, and anything packaged or sugar-filled. I also learned many years later when I was studying nutrition that I’m a “super-taster,” so certain vegetables like broccoli taste very bitter to me. I avoided anything green just for that reason. However, my health suffered from my poor eating habits and I remember getting sick quite often. When I was about 10 years old, my dad experienced financial bankruptcy and my home environment became incredibly unstable and filled with stress. We ended up having to sell our home and most of our belongings. It was around this time that I turned to food for comfort. I curled up on my bed with a blanket, a book, and a bag of candy hidden under the pillows. I retreated into that veil of safety even just for an hour. My sister and I lived temporarily with an aunt and uncle before moving from Oklahoma to California to reunite with our parents. As we started a new life from scratch, my addiction to using sugar for comfort took hold. The candy binges turned into a daily ritual and were the only thing that made me happy when I came home from school. I was deeply ashamed of my habit and the cycle of guilt, shame, and lack of self-control around food began. At the same time, my weight increased, my skin broke out, and my self-esteem plummeted. The self-loathing was so intense that I often wished myself dead. This unhealthy behavior and self-loathing went on for a decade. I felt so alone and I had no motivation, education, or role models to make healthy changes. By the time I reached college, my hormones were so unbalanced that I had never had a normal menstrual cycle. The only option I was given by the doctor I saw was to start hormonal birth control. Going on the pill regulated my cycle, but then led to anxiety and migraines. I was still so disconnected to my body that I didn’t realize the significance and continued to take the pill for 15 more years. After getting my bachelor’s degree, I started my professional career as a fundraising executive for non-profit hospitals. The long hours took a further toll on my health. Although my candy binges were less frequent, new addictions and other unhealthy coping strategies developed, such as over-exercising. At this point, the low-fat craze was also in full swing, so I thought it was healthy to run on the treadmill for an hour, and then go home and eat fat-free cookies and ice cream. The bright spot during my 20s was meeting a sincere, funny, sweet man who became my boyfriend and, later, my husband. We just celebrated our 14th wedding anniversary yesterday, btw! While falling in love helped me immensely from a mental standpoint (and probably saved my life), we were both busy professionals and didn’t eat very well. We ate at restaurants a lot and both gained weight during the first few years of our relationship. I also further increased my stress level by enrolling in an incredibly demanding full-time graduate school program. 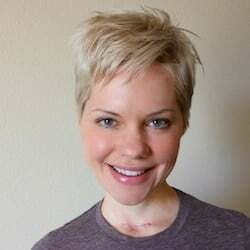 Around that time, I developed extreme fatigue that led to being diagnosed with Hashimoto’s thyroiditis, an autoimmune thyroid condition, along with multiple thyroid nodules. My endocrinologist said there were no dietary or lifestyle changes I could make that would help, only revealing that eventually my thyroid would be completely devastated by the disease. (I now understand from working with a functional medicine physician that there actually are a lot of dietary and holistic ways to reduce thyroid antibodies. I sure wish I had known that back then). My migraines were also occurring almost daily by this time, as well as debilitating panic attacks that left me unable to maintain many of my relationships. When I asked a different doctor for help, his only suggestion was to consider taking an experimental daily drug that was being used for seizures. I was horrified by the idea of having to take such a strong medication and refused the prescription. The red flag that I felt at that time was my very first inkling that I needed to take some control over my health. Throughout it all, I hid my fears from everyone around me, including my husband. I devoted a lot of energy to keeping up a fake appearance, always smiling and pretending that I was doing okay. Looking back on it, I can see that I was slowly dying, and suffering in complete silence. Finally, in 2004, I saw the movie Super Size Me about the guy who eats fast food for 30 days. I wasn’t that surprised that he got sick after eating this way, but I was inspired by the fresh fruits and vegetables that his natural chef-girlfriend prepared for him after the experiment was done. The food that helped him recover looked so vibrant and nourishing, and nothing like I had ever thought about buying. I went straight from the movie theater to the grocery store and filled my cart with as many fresh foods as I could find. This was the first step I took in the long journey to recover my health. Sadly, though, my thyroid disease also took a serious turn in 2012 when I was diagnosed with thyroid cancer. I had surgery to remove the tumor, but had a very hard time adjusting to life without a thyroid gland. I started experiencing symptoms including chronic skin hives, fatigue, depression, and increased food sensitivities. I also became overly vigilant about my food choices and developed a type of eating disorder known as orthorexia. At this point, I realized the vegan diet was no longer serving my needs. Finally, in 2015, I began working with functional medicine physicians and practitioners who helped me develop a plan to address the root causes of my health problems and figure out the foods that would nourish and sustain me. I also consulted an eating disorders specialist to address some of the unhealthy beliefs I had around food. Now, a few years later and at the time of writing this post, I feel like a “clean eating” approach is the best description of a flexible, real food way I choose to eat. I even re-named my blog Clean Eating Kitchen! That’s how much I like this approach. As a result, my overall inflammation has decreased tremendously and my health issues are much more manageable. Best of all, I enjoy an abundance of colorful, nutrient-rich foods that are satisfying, healthy, and delicious. I learned my lesson that my ideal diet is much less about perfection or following a strict plan, but doing my best each day to eat foods that nourish and satisfy me. I continue to share my health challenges and updates here on my blog, so please join my email list so we can keep in touch. As always, I want to hear from you! Feel free to share your story in the comments. Or, you can always e-mail me directly at carrieATcleaneatingkitchenDOTcom. YOU are the reason I keep blogging and working in this space. Thank you for helping me so much along the way, I can only hope that I am giving back at least a little bit of the support, knowledge, and encouragement I’ve received. XO. Thank you, as always Carrie, for being so open and honest about your struggles. I have had many similar difficulties (anorexia in college, Hashimoto’s, weird rashes and debilitating fatigue, not to mention a history of familial cancer). My dad was an exterminator so we had many harsh chemicals around when I was growing up (including some that were later banned!). My mom loved doughnuts, so sugar addiction was certainly present from the beginning. I cleaned up my diet, but was unable to lose weight. After my first brother died from cancer, for 14 years I did a 45-day juice fast which has still been my only way to lose any weight – but I always gained it back. Even a strict plant-paced diet, doing food allergy tests and cutting out half of my food sources didn’t work! That was probably orthorexia. I’ve been to doctors, hypnotists, I ran a marathon, you name it. At your prompting I am now seeing a Functional Medicine doctor. Still doing tons of tests and taking all kinds of supplements. The only thing that seems to be making a dent so far is DNRS training (retrainingthebrain.com), which is daunting as you have to commit to a minimum 1 hour practice for 6 months, but also JOYFUL. Hugs to you, and wish me luck! Thanks for sharing your story, Linda, and you KNOW I am sending you luck and love on your journey. I also went through some serious brain re-training during my thyroid cancer recovery. It was life-changing, although I had a lot more work on the physical/diet side to do. Genetic testing has been really interesting for me, as I have the MTHFR gene and need targeted supplementation for that. I’m so glad you are working with a functional medicine doctor and doing the testing that should help direct your treatment and recovery. Sending you LOVE and JOY and HOPE always. XOXOXOXOXO. Hi – Just curious, are you still taking birth control? My 18 year just started taking it for her skin and I’m very concerned. Thanks for your story! I’ve been overweight for my entire life, and I’ve tried multiple diets, but in 2012, orthorexia took hold, and it was entirely different. I was so sure I was healthy because I was obsessed with the “right” foods. I lost weight, but I developed HA and went on birth control because I refused to admit to myself or my doctor that I was overexercising and seriously restricting my eating. The lowest point I can think of was the night before I was due to leave on a fun trip with my two close friends, and I found myself on the floor crying because I wouldn’t be able to control my meals. Thankfully, I finally realized that my habits were harming me rather than helping. I didn’t see a therapist, but I took a close look at my social media habits to be sure I wasn’t being inundated with ideas that contributed to my disorder. It’s been a good couple of years since then, and I’m so grateful I got off birth control after only one year and managed to patiently work toward getting back my cycle. I appreciate your blog and story so much! Ohhhhh, thank you for sharing that Ashley!!! Reading your story made me remember my own struggles, and thinking about how social media played into that too. I’m so, so glad you were able to find a better place for your health. I remember having to exercise for 3+ hours a day to maintain my weight, and losing my period because of it. I’m THRILLED to hear that you’re doing better. You are amazing and strong and resilient, and you inspire me. Thank you! XOXOXO. Thanks for sharing Carrie! Reading about your struggles and how you overcame helps me understand and take control of my own. Its comforting to know I’m not alone, you are very inspirational! Awwwww, thanks Erin!!! That means so much to me. XOXOXO. This post came at the right time for me. I recently completed an appointment with a functional medicine doctor. She actually is an MD that chose this path. Living in a somewhat rural area I was surprised to find one. Not much for conventional medicine, I was hopeful that maybe I can become healthy. I had a 90 minute consult & had blood drawn. I went home & completed the saliva test. This past Thursday I had another appointment to go over the results. We put a plan together that involves 1 Rx & multiple supplements. A follow up visit is set for October. I am very hopeful. But reading on the internet, I have begun to wonder if functional medicine is a farce. After reading your success, I feel so much better with my decision to take this path. The one thing we did discuss is that perhaps my lifestyle has lead to some of my issues. ( I am a vegetarian) but at this point we are at the decision that it is okay. But we may have to revisit this topic. I hope you will share more on your functional medicine experience. Hi Paula! Thanks for sharing your experience. I hope you get some improvement after your appointment and labs. Functional medicine is most definitely not a farce, I think it’s the answer for many of us who are suffering with health issues. I love the idea of addressing the root cause of symptoms, rather than just using a band-aid like most “regular” doctors use. At least for me, my experience with functional medicine has been life-changing for the better. I only wish I had been raised with healthier habits since it’s so much harder to put out the fire than preventing it, so to speak. Sending you my very best to you. I will continue to share my experience and I hope you keep me updated on how you are doing. XOXO. Thanks so much for sharing about your journey. I also grew up in the 80s and had all of that processed food. It’s crazy thinking about it now since that’s been removed from my lifestyle for so many years. I’m just grateful to know better now and have been raising my children on a real food, whole food, organic diet. Thanks, Emily! What lucky kiddos you have! XO. Carrie! Girl we are from the same decade sweet friend, and I swear our generation is the one that is going to turn things around! I am an 80’s kid too – white bread, alllll the processed cereal, etc. I can so relate to all of your struggles – you are so brave for sharing your story! Thanks, Renee! I love reading about how you are raising your kids on whole foods. I also love seeing all the millennials who are cooking real foods and seem to know intuitively the connection between food and health. It’s never to late to turn things around, I feel like I’m living proof of that and it sounds like you are, too. XOXO. Love that you look much healthier now! Like, you have a healthy glow and everything! Thanks, Tina! Must be all those green veggies!!! 🙂 XO. I love hearing stories because it helps me realize I am not alone. I lifetime of disordered eating and then hormonal birth control, Hashimoto’s, and hormone imbalances. Thank you for sharing. Hi Holley, I’m so glad my story makes you feel less alone. It’s actually pretty scary how many women are affected by these conditions. I’m so grateful to have communities where we can recover together. Sending you tons of love. XO. Hi Michele, oh thanks for sharing that. I agree, it’s such an amazing feeling when you figure out what works for you. Paleo actually gave me hope and guidance and I’m so, so grateful for that. I worry about everyone, too, so it’s great to feel like I’m at a strong place so I can do whatever I can to help others. XO. Thanks so much for sharing your story! So amazing that you found healing through food and real food nutrition. I hope your story inspires others who are sick and hopeless! Thanks, Jean! Me too! Xo. Thanks for reading my story, Jessica, and for your note. XO. Loved reading your story and journey. I’m a super taster too! I still have problem with certain veggies. I’m so envious of my friends who can eat mass quantities of veggies and enjoy them, while I gag them down like a three year old! Ha ha, that sounds just like me, Stacey! It’s a big reason why smoothies work so well for me. Thanks for the note and for reading my story. XO. Wow such an inspiring story, and good to remember that it takes time to go from a processed diet to a clean eating lifestyle – it’s definitely a journey! I know it’s taken me a while, but slowly over time I don’t crave those foods anymore, and only want the fresh vibrant produce! Thanks for sharing your story, a heartfelt one. It’s incredible what you’ve been through and I’m glad that you are on the other side! Thanks for sharing this. 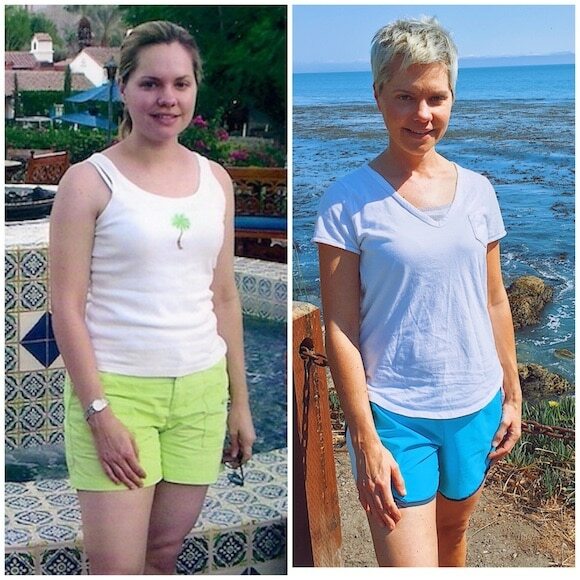 It’s amazing how transformational real food is and I’m so glad you found what works for you! Thanks, Kelly! That means so much to me. XO. Hi Carrie, this may be a dumb question, but what exactly is a functional medical doctor? I am a clean eating chef and I can’t say that being so means my kids eat healthy! They do of course eat lots of healthy stuff, but I generally get cries of ‘Oh not mum’s healthy food again’, or ‘It’s Organic! Yuch!’ etc.. so they have a mixed diet that is healthy and unhealthy at the same time. I think they will adapt though as they get older and at least they have heard me explain a 1000 times why this food is a healthy food- i don’t accept that there are good and bad foods by the way- I think everything in moderation.. Thanks for the note, Melanie! It sounds like your kids are lucky to have such a healthy mom, even if they don’t realize it yet. Keep up the good work!!! XO.